In the corner of Emerald City Comic Con, a glowing carnivalesque sign lights up a corner of one of the showroom floors in glorious block lettering. It’s the addition to a cosplay outfit that you never knew you needed. 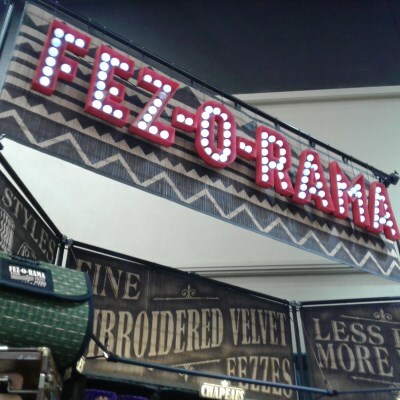 Even the Fezzmaster himself, Jason Rodgers, never thought he would be a con-hopping Fez aficionado. Most designs stay around for a year and a half. He does fezzes for the Laurel and Hardy Fanclub, but mentioned that he’s also had six different Cthulhu designs in the past. Originally the embroidery used to be closer to 30 minutes – now some of the more complicated designs can take as much as 80 minutes with multiple colors. They’ve also run fez designs specifically to give back to causes like Habitat for Humanity and so on. The hats really are very lush in person, a great take-home cosplay addition from ECCC. There are also enamel pins and shot glasses to be found, and other accessories. They’ve actually got quite a few other stops coming up on their tour for the summer, all of which can be checked out on their website (http://www.fez-o-rama.com). You can snag Rodgers’ original Inktober artwork (as visible on his Instagram @fezmonger) at the booth, too! Not prints, original adorably spooky pumpkinfolk and such in marker. These are con exclusive, so get ’em if you’re here!